DENVER — Condos and town houses are rising beside the weedy lots here where Randy Russell once pitched a tent and unrolled a sleeping bag, clustering with other homeless people in camps that were a small haven to him, but an illegal danger in the eyes of city officials. Living on the streets throws a million problems your way, but finding a place to sleep tops the list. 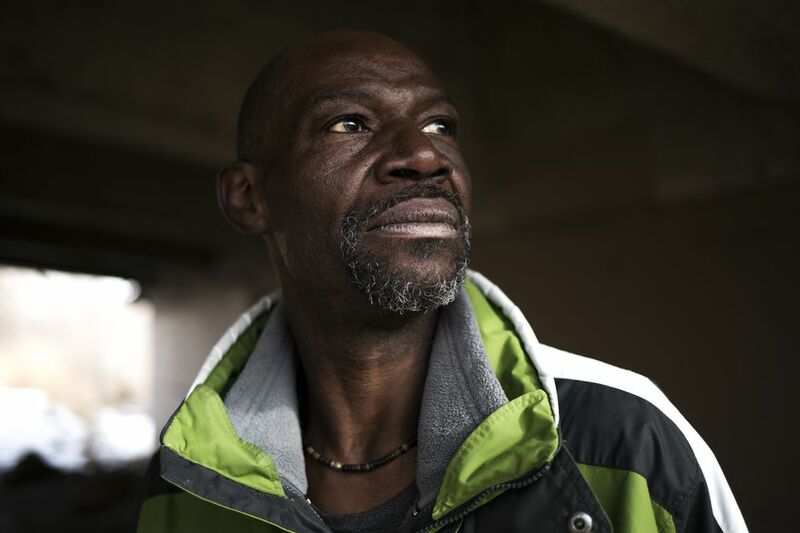 About 32 percent of homeless people have no shelter, according to the federal government, and on Nov. 28, Russell, 56, was among them. He was sitting in an encampment just north of downtown when the police and city workers arrived to clear it away. A police officer handed Russell a citation. "Now I don't have a place to sleep tonight," Russell told the officer in a video. "You're taking my home away from me." Growing numbers of homeless encampments have led to civic soul-searching in cities around the country, from Philadelphia to Chicago to Seattle. Should cities open up public spaces to their poorest residents, or sweep away camps that city leaders, neighbors and business groups see as islands of drugs and crime? 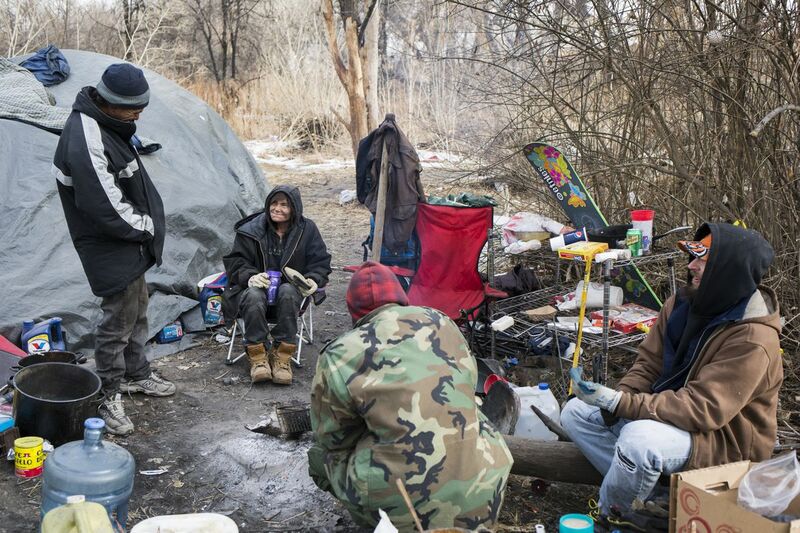 For those on the streets — who have lost their jobs, have suffered from drug addiction, mental illness or disabilities — crackdowns on homeless camps are seen as tantamount to punishing people for being poor. Activists and homeless residents like Russell are waging public campaigns and court fights against local laws that ban "urban camping" — prohibitions that activists say are aimed at the homeless. The right to rest, they say, should be a new civil right for the homeless. Many wear buttons that ask, "Move Along to Where?" and are challenging misdemeanor citations and anti-camping ordinances, like Denver's, in court. "They take away your means of survival," said Jerry Burton, who was ticketed the same day as Russell. In recent years, the Obama administration has offered the homeless and their advocates some support. In a 2015 letter addressing a law in Boise, Idaho, the Justice Department warned that local laws criminalizing homelessness could violate the Constitution's protections against cruel and unusual punishment. And the Department of Housing and Urban Development has said it takes into consideration policies that criminalize homelessness when deciding which places should get competitive grants. Advocates for the homeless said those policies had strengthened their hand. They are now worried about how those measures — and broader funding for homeless services — might fare under President-elect Donald Trump, who ran as a "law and order candidate." 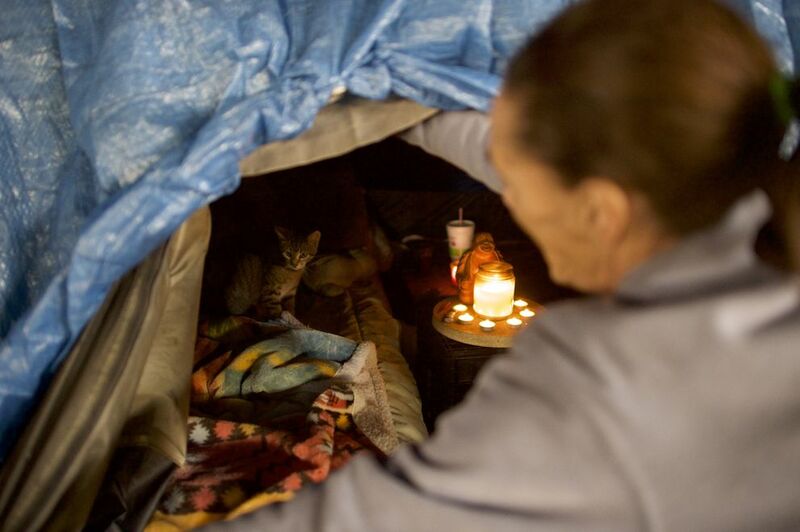 "We're quite concerned," said Maria Foscarinis, founder and executive director of the National Law Center on Homelessness and Poverty, which estimated that half of American cities had some kind of anti-camping law. "No sooner do you win the battle than 10 other cities pop up criminalizing homelessness, Foscarinis added. "The idea was if you could get the federal government on your side, you have a much broader impact." Nationwide, the number of homeless people is declining, according to the most recent counts. But camps have become a particularly acute problem in the West, where soaring housing costs and a scarcity of subsidized apartments have pushed homelessness to the fore in booming towns like Seattle, Los Angeles, Denver and San Francisco. As new clusters of tents and sleeping bags pop up along river banks, on city sidewalks and in parks and gentrifying neighborhoods, they are exposing deep divisions about how cities should strike a balance between accommodation and enforcement. 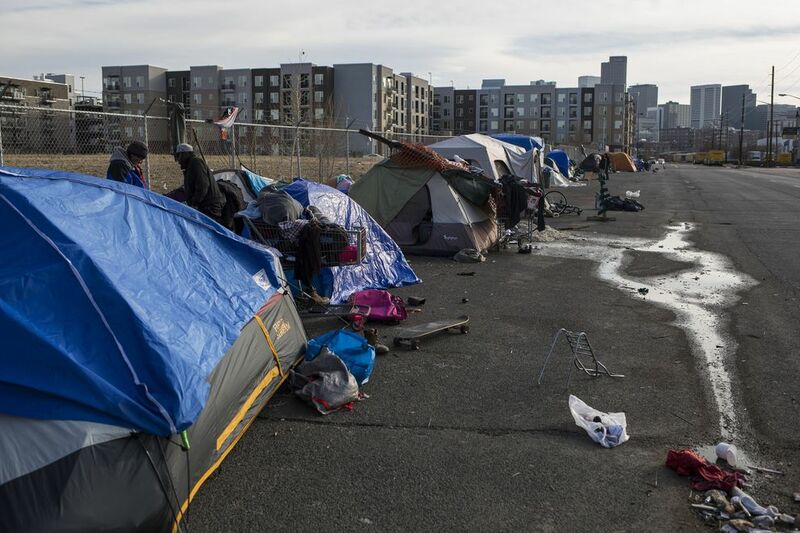 In Seattle, where violence has flared in a homeless camp known as the Jungle, beneath a freeway, there was a fierce response to a councilman's proposal to allow the city's 3,000 unsheltered homeless residents to camp in some parks and on undeveloped public land. Scores of residents packed a City Hall hearing in October, according to The Seattle Times. Some shouted, "Recall!" Others applauded a Republican politician who urged "zero tolerance." "I'm not going to solve homelessness by outlawing it," said Mike O'Brien, the Seattle councilman who proposed accommodating some homeless camps. (The legislation did not get far.) "These folks, they don't have a lot of good options. The best choice they face every day is sleeping under that bridge." Officials and advocates cite many reasons for the growing number of encampments and the clashes over them. Gentrification in old neighborhoods. Citywide housing shortages. Rough conditions in shelters. A one-night survey last January found a 67 percent rise in the number of unsheltered homeless people in Seattle since 2011. "The threat of homelessness is becoming more real," O'Brien said. "More of us know people. They've gone to couch-surfing. They're living in their vehicles. I know people who are losing their housing, and it's scary." In November, San Francisco voted to ban sidewalk tents and allow the city to remove them with 24 hours' notice. In July, Philadelphia lifted a 4-year-old ban on serving meals in public parks after homeless advocates and faith groups sued the city. Portland, Oregon, was so roiled by the blowback to a "safe sleep policy" announced in February that the mayor rescinded it six months later. In Denver, videos of the police seizing blankets and tents on the cusp of winter created a public outcry and demands to soften the city's approach. Denver officials appeared taken aback by the furor. They pointed out that the city was creating permanent housing for 250 homeless residents, had set up a $150 million housing fund for low- and moderate-income families and was starting a pilot program to employ people living on the streets. Denver officials say there is no shortage of shelter space — it is available any night to anyone who needs it. Outreach workers visit camps before they are dismantled to try to steer people to shelters or other services, the officials said. Officials estimate Denver's homeless population at 3,500 to 3,600, about 500 of whom are not in transitional housing or shelters on any given night. In a statement, Mayor Michael B. Hancock said the city would not seize any more camping equipment until the end of April when it enforces the camping ban. According to the Denver police, 26 people have been cited under the ban since it was passed in 2012, and officers issue citations only as a last resort. City officials say the camps are neither safe nor healthy for neighbors or camp occupants. They have found piles of trash by the Platte River and human waste on sidewalk encampments by Coors Field, where the Colorado Rockies play. When the City Council passed the camping ban by a 9-4 vote, supporters said clearing the camps was a health and safety necessity, and they have rejected recent calls from activists to repeal or scale back the regulation. "It's immoral for a community to accept folks on the streets. This is a cold city," said Albus Brooks, the council president. "It's the stuff that keeps me up at night." What keeps Trena Vahle up at night is the cold, the gunshots, the people walking past the tent she has pitched at the end of a line of tents, overstuffed shopping carts and plastic-tarp yurts in an alley just down the block from an architecture studio, brewery and cocktail lounge in Denver's trendy River North neighborhood. "We've been told five times to leave," she said. Vahle, 47, said she had been out of work since she tore a back muscle at the Iowa factory where she made plastic coolers. She said she had moved to Colorado in 2015 after being arrested on a trespassing charge related to homelessness. She did not like the shelters — she had to shower on a lottery system, and three of her bags had been stolen. The alley is her spot, she said. For now.